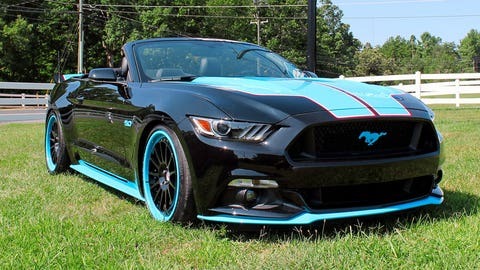 Richard Petty's Garage Mustang GT King Edition. Known to all as simply "The King," Petty continues to lead the Richard Petty Motorsports NASCAR Sprint Cup Series team. And now the seven-time NASCAR champion is also working with Ford Motor Co. to create some bodacious limited edition 2016 Ford Mustangs for the street. Petty’s Garage, the King’s in-house speed shop, will build 243 2016 Ford Mustang King Edition models, 43 King Premier models and 14 King Premier convertibles. Customers can order the cars through their local Ford dealership. The specially tweaked Petty Mustangs produce 670 to 727 horsepower, depending on options. Prices start at $67,495 for the King edition, and $90,495 for King Premier. The cars are covered by full three-year factory Ford warranties and feature an extensive list of engine, chassis, brake and appearance modifications. Each of the cars produced will carry Petty’s signature on a dashboard nameplate. "I’ve always liked the look of the Mustang, and the 2016 model gives us a great base car to work with," said Richard Petty. "These new King edition Mustangs are pretty much the way I’d build my own. They are great fun to drive, and have a signature single exhaust."